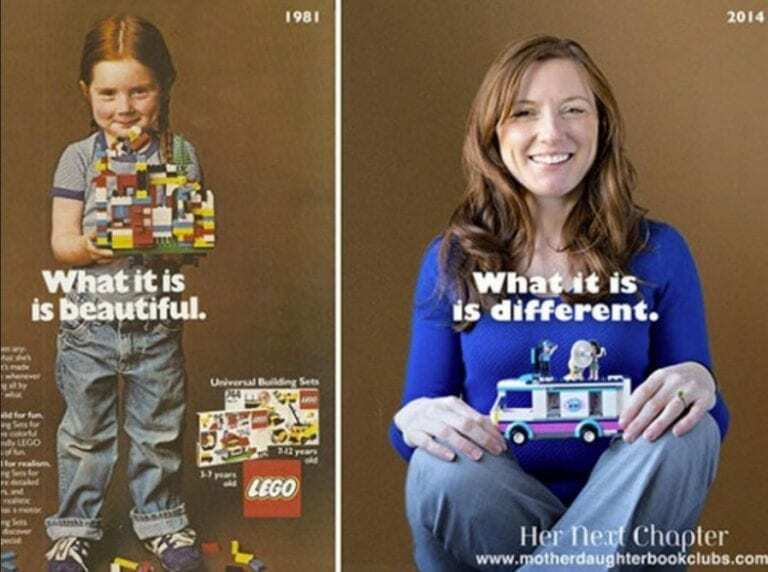 Maybe you saw this 1981 gender-neutral LEGO ad (left) the first time around. Or maybe you saw it more recently, going viral on the Internet to underscore how advertising for kids could be: the little girl in the picture isn’t wearing any pink, and the ad copy is about the pride a child takes in building something on their own. If you’re following: girls playing with LEGOs in 1981 was using your imagination to build whatever you please. Girls playing for LEGOS in 2014 pretending to put on makeup and reporting a fluff story. Rachel told the blog Women You Should Know that when she was a kid, a LEGO toy like that was unheard of. At the ad photo shoot all those years ago, she was given an hour in the studio to make the very LEGO creation that’s pictured in the ad.